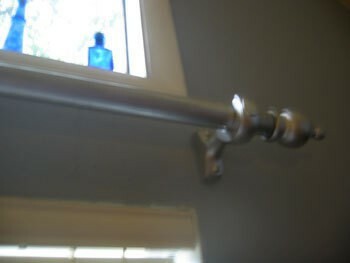 I moved into a house and needed an extremely wide drapery rod for wide windows (over 120 inches) and they would have to be custom ordered and very expensive. Instead, I bought drapery 2 rod finials (the ends) for $6 each, 3 drapery holder/brackets for $4 each and 103 inches of PVC pipe (for $3.50). I hot glued a Styrofoam plug into the ends of the PVC pipe and screwed the finials into each end of the PVC pipe stuffed with Styrofoam. Then I painted the "rod", finials and the brackets with a silver metallic paint and they look like they are made out a brushed stainless steel. You could use black paint or a wood tone or any color to match your decor. This rod can be used with drapes or swags. In fact, it could even be recycled by changing the color or the finials used. I spent less than $30.00 and saved hundreds. And they look great. What a wonderful idea!!! We bought 5 curtain rods and I wanted my husband to put them up before Thanksgiving - - they are going back! You did a great job on those curtain rods! Thank you for posting a picture and telling about them. I may make some for my living room! This could be used for towel rods in the bathroom, too. What a great idea! I was thinking that you used a wood dowel, but PVC is so much better--lighter and cheaper. Did you have to use a special paint to adhere to the PVC? WOW! I am so impressed! I love your ideas and will borrow them for my living room. Creative +. I just love making something from nothing. You rightly should be very proud and thanks for sharing with all of us. Necessity has always been the mother of inventions! You did yourself proud, as Minnie Pearl would say. Thank you so much! I need a long rod that is strong enough to span 240" and it can't be heavy, yours is perfect!!! GREAT idea!! Love saving money but never want it to look cheap. THese look like very expensive curtain rods...I am definitely going to try this idea. Just a quick question.... you said the window was over 120 inches, yet you only purchased 103 inches of PVC pipe? Can you clarify? Thank you so much for the idea. I have been struggling with figuring out how to cover my 3 windows (100" +). I think that buying the extra drapery holder/brackets as you mentioned for in between each window is a great idea to keep the PVC from sagging. Question. Did you have any problems with the paint coming off when opening and closing the drapes repeatedly? What kind of paint did you use? And I thought I was the MOST value-orientated person in the world. YOU ARE THE WOMAN! Great idea. Just going to have to try this on my front window that is 217" long. I have seen this done before, but in addition to the rods being PVC pipe, the rings were also cut from PVC pipe larger than the "rod" and a screw-eye attached to each one. They were about an inch wide. I've done several of these types of curtain rods and have used the heavy round cardboard rolls that fabric comes on in the fabric stores. These cardboard rolls are about 60" long and may be cut with a hacksaw if necessary. I hot glue fabric onto the cardboard roll and rather than use wooden finials I use styrofoam balls (purchased from a hobby store) covered also in fabric & secured with a thick rubber band. Make sure the fabric that covers the styrofoam ball has some tail to it so you can insert it into the end of the cardboard roll; once glued in you'll never see the rubber band. Just hot glue it in and you're ready to hang those great window treatments. I applaud your creativity and thriftiness! I found great deals on rods at Ross, (about a third of the price of Walmart or Home Depot) but if I would have seen this, I may have done it that way. Am wondering where you found finials and the rod holders so cheaply? Good idea. My husband made my rods using electric conduit which cost about 4.00 for ten feet. He cut it to length and spray painted them with silver paint. We bought cabinet knobs for the finials at home depot for 3.00 a piece. He used a wooden dowel which he cut into 3 inch lengths and drilled holes for the knobs. Put the dowels in the pipe and screwed the knobs in. cost less than 10.00 a rod. I have used conduit for years and it is very sturdy. Can be painted to match your decor. Wipe down with white vinegar first. Used dowels as plugs in the end to screw in the finials.